The McLaren P1™ was conceived with one simple but extremely demanding aim: to be the best driver’s car in the world on road and track. As the spiritual successor to the McLaren F1 road car of the 1990s – still widely considered to be one of the greatest supercars of all time – the McLaren P1™ had to redefine not only what McLaren was capable of, but also raise the bar for the supercar world. Five years ago, at 1745hrs BST on Thursday September 27, the car built to achieve this ambition was unveiled as a design study at the 2012 ‘Mondial de l’Automobile’ in Paris. Five months later, the production version debuted at the 2013 Geneva International Motor Show. Leveraging five decades of McLaren motorsport experience and its deep knowledge of road car engineering, the McLaren P1™ represented both the birth of the McLaren Ultimate Series and a quantum leap in technology that delivered previously unknown levels of performance in a road car. 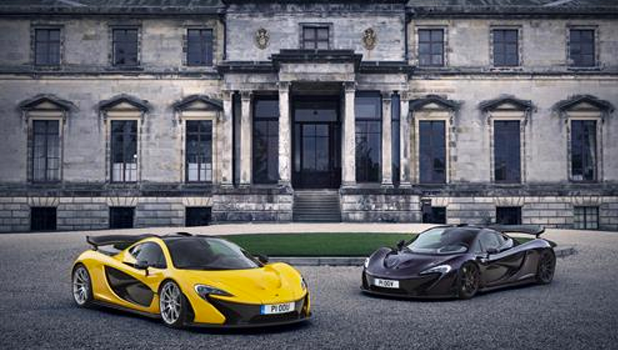 The full production run of 375 cars was sold and allocated before the first was even delivered, such was the insatiable demand for the McLaren P1™. No two examples of the McLaren P1™ were the same; each was custom-built to owner-specification in consultation with McLaren Special Operations (MSO). The cost of MSO features was additional to the £866,000 price of the car. 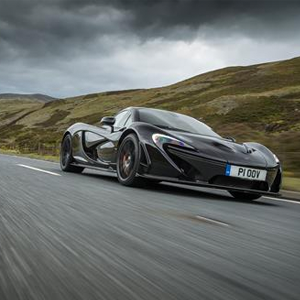 Aerodynamic performance was prioritised from the outset of the McLaren P1™’s development. Using CFD (computational fluid dynamics) aerodynamic modelling and wind tunnel testing, McLaren designers engineered a car that produces an astonishing 600kg of downforce at well below its electronically limited maximum speed of 217mph (350km/h). A Formula 1-style DRS (drag reduction system) helps to achieve the downforce, with the pitch of the rear wing changing to reduce drag and increase straight-line speed. The wing can also operate at an even steeper angle, as an airbrake. In addition to the active, adjustable rear wing, the aerodynamic performance of the McLaren P1™ is optimised using two flaps mounted under the body, ahead of the front wheels. The flaps change angle automatically to increase downforce and aero efficiency, boosting driver confidence as well as speed. Optimising weight while ensuring maximum strength and rigidity was a development imperative for the McLaren P1™ and is reflected in every aspect of the design. The dry weight of the car is just 1,395kg (3,075lbs). The McLaren P1™ is based around a McLaren MonoCage, a carbon fibre structure that weighs just 90kg yet provides outstanding rigidity and safety while also guiding air into the car’s engine through an integral roof ‘snorkel’ and air intake ducts. To keep weight down, all five main body panels that comprise the McLaren P1™ are made from carbon fibre. A further 1.5kg was saved by omitting the top layer of resin from interior carbon fibre components. The fixed-back, carbon fibre-shelled race seats weigh just 10.5kg each. Super-lightweight glass for both roof and windscreen – respectively just 2.4mm and 3.2mm thick – saves 3.5kg over conventional glass. The lightweight brakes are 4kg lighter than a comparable ‘standard’ braking system. The focus on weight was such that the original specification of the McLaren P1™ did not feature sound-deadening material or even carpet in the cabin. The hybrid, petrol-electric IPAS (Instant Power Assist System) powertrain of the McLaren P1™ set new standards for innovation and performance when the car was introduced. A modified version of McLaren’s 3.8-litre twin-turbo V8 petrol engine, tuned to develop 737PS (727bhp) combined with a lightweight electric motor producing 179PS (176 bhp) – more than double the power of the KERS unit used in Formula 1 at the time – to give the McLaren P1™ astonishing performance. Together, the petrol engine and electric motor produced 916PS (903bhp), resulting in acceleration of 0-100km/h (62mph) in 2.8 seconds; 0-200km/h (124mph) in 6.8 seconds and 0-300km/h (186mph) in 16.5 seconds – a full five seconds quicker than the legendary McLaren F1. The instant response of the electric motor provides sharper throttle response more usually associated with a normally aspirated petrol engine. It also helps to deliver quicker upshifts by applying negative torque to allow engine revs to fall more rapidly. When off-throttle and under deceleration, energy that would have otherwise been lost is recovered to the battery by the motor. The battery for the IPAS weighs just 96kg and is mounted low down, on the underbody of the chassis. The McLaren P1™ can drive solely on its electric motor for up to 10km (6 miles) on the NEDC (New European Driving Cycle), allowing the car to be used in low emission zones and for urban driving with near-silent running. 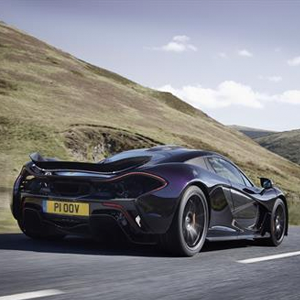 McLaren P1™ CO2 emissions overall are just 194g/km. The McLaren P1™ underwent the same rigorous development and testing regime as any McLaren car, with a total of 620,000km (385,250 miles) driven on road and track – equivalent to 15.5 times around the world. Cold weather trials took place on frozen lakes in northern Sweden during an Arctic winter at temperatures as low as minus 30˚C. The Experimental Prototype (XP) cars were then taken to the desert heat of Arizona, California and Nevada, where temperatures soared as high as 52°C as the western coast of The United States experienced some of the hottest temperatures on record. The focus on durability, refinement and performance during the development programme also saw the McLaren P1™ tested extensively on race circuits around the world, including at the famous Nürburgring-Nordschleife, where the car achieved its target lap time of less than seven minutes. The McLaren P1™ spawned an even more limited volume, track-only version, the McLaren P1™ GTR. Resurrecting the model name that adorned the Le Mans-winning F1 GTR in 1995, the McLaren P1™ GTR made its global debut in production form at the 2015 Geneva International Motor Show. The car boasts a power-to-weight ratio of more than 700PS per tonne, an increase of more than 10 per cent over the road-going McLaren P1™. Track-optimisation of the petrol-electric powertrain produced maximum power of 1000PS (986bhp). The McLaren P1™ GTR features further weight-saving measures and enhancements to the aerodynamics, driving dynamics and handling balance. The wing mirrors were repositioned to the A pillars to put them closer to the eye line of the driver and reduce aerodynamic drag. The car sits at a fixed ride height, on race-prepared suspension and motorsport alloy wheels. An all-new, titanium alloy, straight-cut, twin-pipe exhaust system was designed exclusively for the McLaren P1™ GTR. Available only to McLaren P1™ owners, the track-focused GTR began production upon completion of the 375th and final road car. Buyers of the McLaren P1™ GTR were invited to participate in an exclusive driver training programme that saw them experience some of the world’s most iconic racing circuits, behind the wheel of one of the most extreme limited-production track cars ever built.